It’s important to come to Lodge Meetings. You see how business is done. You have a voice in Lodge affairs. You get to vote on new members. If all that doesn’t matter, we have free hot dogs afterward. It’s more fun than humans should be allowed to have. Prepared by Members, Served by Members, FOR OUR MEMBERS! Besides getting a great dinner with fresh bread and stale jokes, our birthday dinner is always a chance to meet our new, incoming members joining the Lodge. 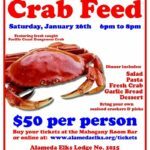 We’re having our Annual Crab Feed, featuring fresh caught Pacific Coast Dungeness Crab. Tickets are $50/person … get your tickets HERE! Bring your own seafood crackers! Remember to bring your membership card!